Top HR executives in Delhi-NCR discuss ethical leadership and how to keep young managers engaged. Being ethical not only makes people feel good about themselves, it is also good for business. It builds trust and inspires young people - and every organisation wants to keep the young and impatient generation engaged. The third and final leg of the Business Today Knowledge Forum on Human Resources (HR) held at The Oberoi, Gurgaon, on March 19 discussed ethical leadership, as well as young people in the workforce, at length. The first and second legs were held earlier on February 17 and 26 at Bangalore (see www.businesstoday.in/btknowledge-blore2014) and Mumbai (see www.businesstoday.in/btknowledge-mbai2014) respectively. 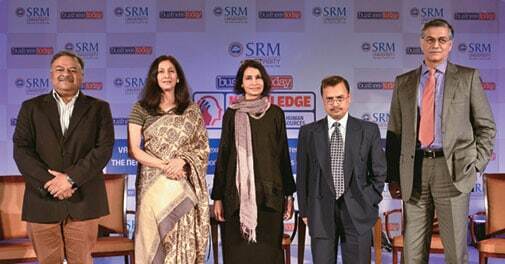 Shamni Pande, BT's Senior Editor, moderated both the panel discussions that took place. The subject for the first set of panellists was Value system: Why ethical executive leadership is increasingly important to employees. The panel comprised Sanjay Singh, Director-HR and Administration, Cairn India; Nina Chatrath, Founder, Enhance Consulting; Shailesh Kumar Singh, Director and Chief People Officer, Max Life Insurance; and S. Sanjay Sen, Group Vice President HR, Avantha Group. Sen opened the proceedings. "An important role that ethical leadership has is that of a role model," he said. "It is not about what you are getting done, but how you get it done." Singh of Max Life Insurance agreed, adding that for leadership to sustain and win customer trust, it had to be ethical. "Leaders are those who have practised what they preached. In the emerging markets, this has become more relevant than it was a decade ago," he said. Moving on to his own sector, he added: "The insurance sector is very heavily regulated. A lot of innovative practices and consolidations have happened across this sector." WATCH THE PANEL DISCUSSION HERE Cairn India's Singh dwelt on the importance of education in building ethical leadership. "We are running workshops on what's right and what's wrong. We need to educate ourselves in order to build leadership," he said. The growing emphasis on ethics in companies has led to the rise of the compliance officer - many organisations now employ people in that capacity. "A compliance officer is brought in when there's a dilemma," said Nina Chatrath of Enhance Consulting. "What measures does an organisation take to revisit its ethics' practices? How many stand up and become whistleblowers and get protection for raising their voice against what is wrong?" The topic of the second panel discussion was: The new core: Dealing with work habits and expectations of the new generation of workers. The participants were Vijay Deshpande, Vice President and Head HR, JK Tyre & Industries; S.Y. Siddiqui, Chief Operating Officer (Administration-HR, Finance, IT, Company Law and Legal), Maruti Suzuki; Ashutosh Khanna, Client Partner, Korn/Ferry International; and Sameer Wadhawan, VP-HR and Services, Coca-Cola India and South West Asia. Wadhawan of Coca-Cola began by saying that the current generation has grown up using devices, and the language it understands is different from that which older folk do. "It's better that you become aware of the millennials (people under 30) at the workforce. It is extremely important for us to look at the global perspective. These people come with a lot of individualism, achievement and passion, and what we are realising is how we can tap into their passion." JK Tyre's Deshpande agreed with Wadhawan and said if the young managers were happy at their workplaces, they would be engaged with their work, and if they were not happy, they would not be engaged - it was as simple as that. He went on to add that it took young people to call it quits at a job and move on. "To keep the young workforce engaged, we need to know it. Communication is also easier with these people, it's not complex? If they have done a good job, you need to tell them instantly as they won't wait for the annual cycle to hear that. Understand them and build an emotional connect with them." So, how do organisations strike a balance between the different generations at work? Maruti Suzuki's Siddiqui believes a new leadership will be required to engage and retain the younger population. "For the last 10 years, we (at Maruti) have been experimenting on a bouquet of human resource policies. For youngsters, compensation must have a cash element in it, while for the older generation, it is the benefits that matter." Were companies promoting young leaders at an early stage? Were they being prepared to take on responsibilities? Korn/Ferry International's Khanna regretted that organisations do not really make any preparations for their young workforce. There is no career planning for them within organisations and young people are often clueless about their career paths. "How do I engage with an audience that doesn't know its mind? They know they won't be without a job because if one company doesn't pay, another will." The panellists concluded that a huge shift in work culture as well as HR policies had taken place, but there was need for a lot more communication with young people as well as suggestions, clarifications and questioning. 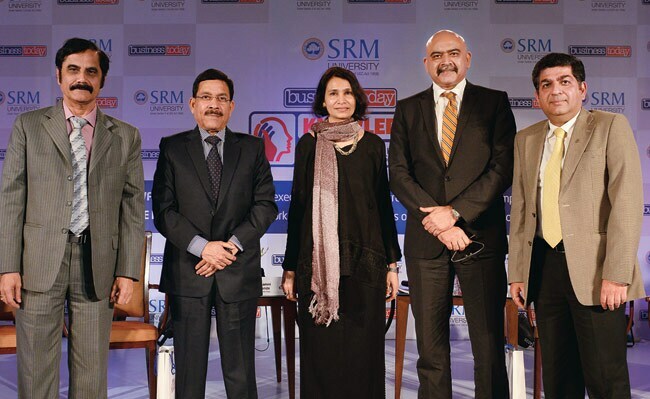 SRM University was the presenting sponsor of the event.